Please pull in drive way located on Melrose Avenue, where valet parking attendees will greet you. Mario Jr. will be happy to customize a menu to service you in large or small event setting to meet your expectations and work with your budget. Marino Ristorante is deeply rooted in the idea of doing all things the right way. Today the family owned restaurant, is giving its welcoming by Mario, Jr. and mom, Maria. The room is simple. A wall of glass, softened by out of door planters full of ficus, faces the famous Melrose Avenue. The soft colored walls, starched white linen cloths, the silver sugar caddy and votive holders and subdued oil paintings all come together to create its appeal. And then there is the food. Ciro, Mario and Sal were the first of the handful of chefs who are out daily in the early morning markets personally selecting the ingredients for the menu and seeking out the most interesting and pristine items for the specials. Placing yourselves in Mario’s hands for the tasting menus proves to be a wise decision. Also known for his knowledge of wines Mario will recommend the menu and wines to best meet your dining expectations. The Marino wine list has been repeatedly an award winner by Wine Spectator. Totally authentic Italian delicious food! Great atmosphere - Owners make sure to come by and check on guests. Super dedicated and friendly. Highly recommend. Excellent food and gives you that welcome home feeling. Friendly neighborhood atmosphere with an upscale ambience. The food is fresh, with seasonal options and delicious. The halibut and spring salad were both amazing and my husband enjoyed the lamb ragu pasta special. Good wine selection too. My wife and I have enjoyed Marino's many time. This time we brought friends who all said they would return! I've been a fan of Marino for 25+ years; well everybody has a bad day once in a while. This was the first time ever they've disappointed. Two of us has the lamb special, the lamb was fatty and simply didn't taste that good. Two had the lobster and pasta dish and both said it was hard to find much in the way of lobster. Especially disappointing since once again we had guests in from out of town and I had bragged about what a great place it is! Always love the food and service! I have traveled everywhere and Sal is on top of my list. Marino is a complete package! Anyone looking for a gastronomy experience, Marino is a must try. Your get real food there! Perfect. Everything we had was phenomenal. We will be back, lovely to have an old-school restaurant still around with great service and great food! * five stars. Pasta was fantastic, old school 50’s ambience and incredible service! The owner took a lot of time getting to know my wife and me. We’ll def be back! WOW WOW WOW. Sal outdoes himself again. We had his signature seasonal burrata and pea Salad, razor clam appetizer (to die for), ravioli in tomato sauce. Followed by spaghetti vongole, shrimp tagliatelle with fresh tomato, fish special. Everything was truly exceptional. Andrea, Daniel, Toniya, Mario, Cornelius make dining there a true pleasure. Thank you Sal& everyone. My favorite old school Italian restaurant in Los Angeles. The ambiance is great, the service always impeccable and the FOOD! Last night, as a starter, we had some delicious grilled Santa Barbara prawns that were so good, we ate the shells. I'm not kidding. They were like potato chips! We didn't see a pasta on the menu that seemed light enough for us, so they whipped up a special Marinara sauce that was not on the menu. Simple, light and perfect. We had the Branzino, baked in a salt "shell". Fabulous. No one other than them does it that well outside of Italy. The whole meal was complemented by a Barolo wine the waiter recommended that was the perfect accompaniment to the meal. We topped it off with their famous Tira mi su, so light and fluffy..the best in town! All in all, the perfect meal. I come here whenever I want to treat myself or friends. Food and service were amazing. My husband and I had our first date at Marino, we got married here and come back every year to celebrate. 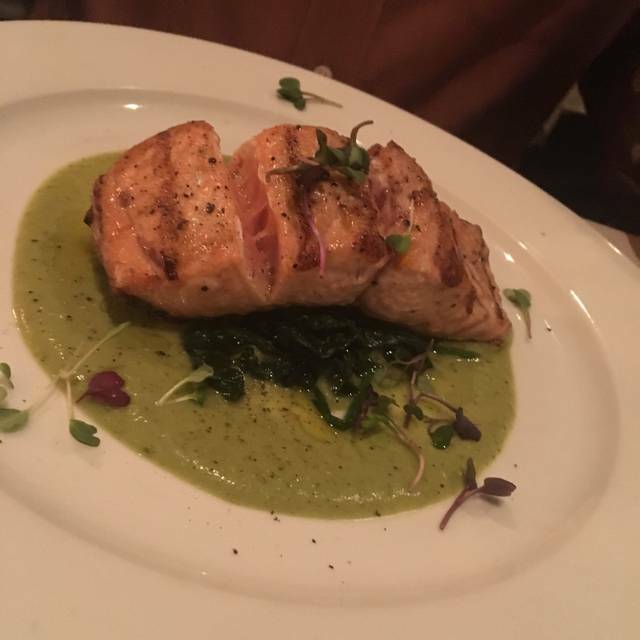 Marino's is one of our favorite restaurants! The food is always delicious and the wait staff are very attentive. The room is quiet so you can enjoy a pleasant conversation with your tablemates. I highly recommend this restaurant to all my friends and not just for special occasions. If this was our first time there we would not return. The evening was not up to their previous standards and they knew it as we were repeatedly told by the staff. I would still recommend the restaurant as our previous experience was a very enjoyable evening and a delicious meal. My first time at Marino was extremely pleasant. Wonderful, accommodating wait staff and lovely ambiance. However, the food itself was a bit secondary to its other attributes, though we only had big salads so didn't have a wide swath to judge! Sal is my favorite Italian chef period. The constant innovation with the freshest seasonal ingredients is much needed in these types of fine establishments so we don't get bored dining out. Knowledge & attentive service is A+. Marino's is the "go-to" restaurant for entertaining, business or just a small family gathering. They are warm, welcoming and the food is just great. This is the best Italian restaurant in LA. It’s vey much an old school, family run establishment with delicious classic dishes and wonderful atmosphere. The co-owner, Mario Marino, who inherited this place with his brother Sal from their father, was a terrific host. I spent a wonderful evening here with friends and will make it a point to come on all my LA trips. As with every other experience at Marino’s, the service is impeccable and the food and ambiance match accordingly. Great spot! We love this place. Small and personable. Great ambience. Good food. Super-old school and fantastic. Mostly an older crowd, but I would think very welcoming of younger people. Three of us shared two pastas and each had an entree, then shared one dessert. What I tasted: tortelli with squash in a butter/sage sauce (good, classic), I forget what kind of pasta with rabbit white bolognese (fabulous, kind of funky, maybe a little anchovy? ), a butterflied veal chop with spinach and shitakes (fantastic), ricotta cheesecake (very good, a tad sweet). Mario was so warm and welcoming. Wine list was excellent, and Mario did not push the most expensive when asked for advice. What we ended up with was great, and followed a long and engaging conversation about how and what to choose, wine-wise. Only small complaint: the veal chop was ordered medium rare/medium, came rare/medium rare, and when returned (with major grumpiness from Mario's backup guy: "This IS medium; whadda ya want, well done?") came back well done. Such an excellent piece of meat, it was fine, but that part of the service experience was not so great. 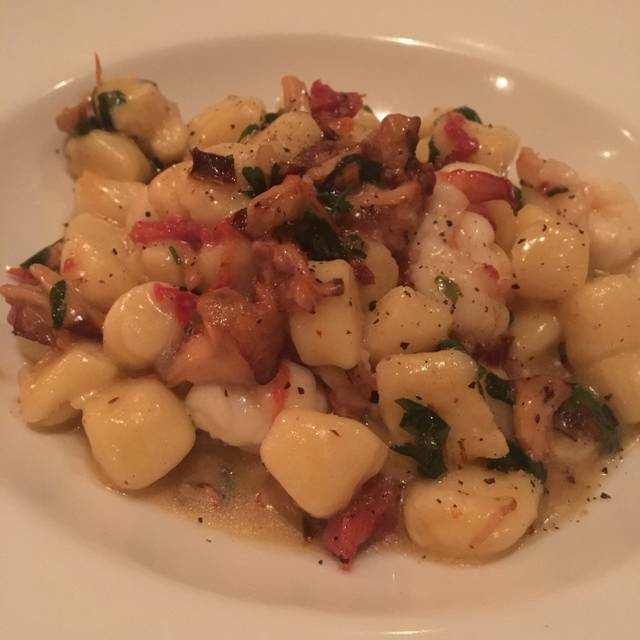 Not your typical neighborhood Italian—gourmet food and great service. Mario runs the place with precision and panache. Staff is extremely friendly and professional. We have only recently discovered this local gem. The food is wonderful! I'm glad we made course selections beyond what seemed like good combinations of ingredients. Our first appetizer was tuna tartar with fresh pear. We made a reservation to enjoy their last week of white truffles. 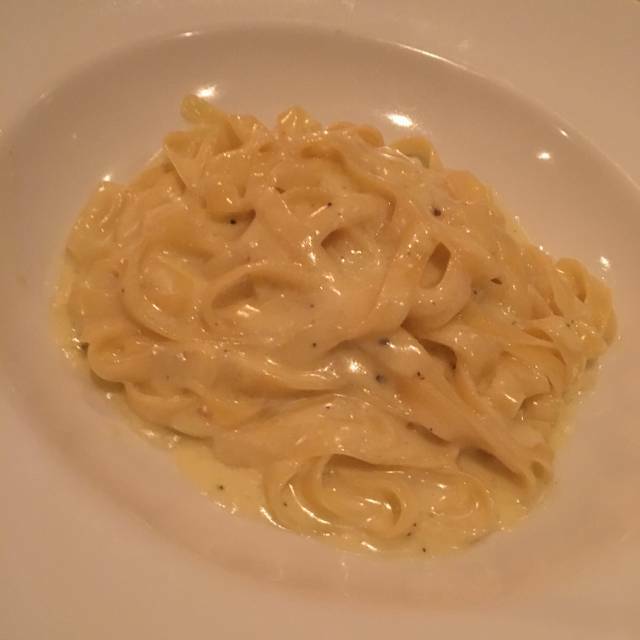 The white truffle pasta was divine. The waiter made very good suggestions for wine and making our dinner complete. I believe his name is Danny. Simply amazing. The food, staff, ambiance all combine to create a true gem. Always top-notch, have been many times and never disappoints. My first time visiting and I must say I was very impressed. I had the pappardelle bologenes, my friend had the salmon. Both were of very high quality and tasted great. The lovely environment and tentative friendly service was a great reminder that there is still some class and civility in this world. Fine dining that will impress any critic and their date. Highly recommend. Simply great! The best manager in LA. Wonderful food---Owner Mario treats all guests like family. Service spot on. We have been going to the restaurant for many years so it was a surprise and a huge disappointment. We went for New Year's Eve. The menu said Halibut but they served Branzino. The gentlemen on the phone told me it would be sea bass. The fish was terrible. If I would have known before I would have not gone because my 14 year old does not eat that fish. She did not eat anything the whole night. None of the courses where very good. For a place I have been going to for over 20 years to be that bad is just sad.